On eBay, an auction surfaced for a "Beast Eaters" Swamp Smasher box mock-up. As far as I know, nobody has written about these before and no prototypes exist. 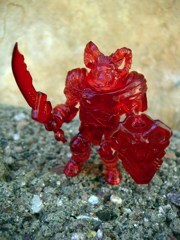 If you know anything about this, or other unreleased Battle Beasts products from the 1980s, don't be shy! Reach out and touch us! UPDATE: On May 29, this item sold for $583.49. While for the comic book, new sketches of amazing, awesome, and otherwise fantastic new designs are surfacing at Previewsworld.com. Sumo Blowfish is presumably not a final name (or even a guaranteed toy) but dang if that doesn't look like it would make a fun figure concept. A few new figures (and an interview) can be found here and is well worth your time to read, drool over, whatever it is you kids do. 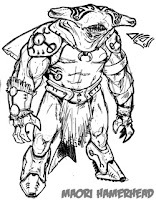 Maori Hammerhead is also quite striking and I gotta say these sketches really do show that this line might be slightly more open-ended beyond "animals in armor" which could make for a ton of interesting figures. 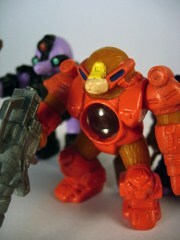 Over at ToyChestNews, Zach Oat of Diamond Select toys answers some questions about the one thing we're all looking forward to, new Battle Beasts! Click here for the full interview. 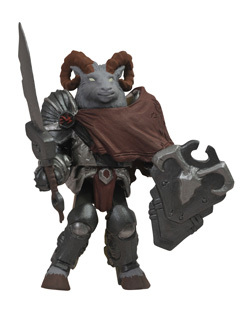 "The first Beast toys we'll have for sale will be a San Diego Comic-Con exclusive two-pack, featuring Vorin with his cloak down and an evil dragonfly character named Zik." "Series 1 has both a scorpion and a tarantula, and both of them utilize a new four-pegged hip piece, which allows them to walk around on four legs." "There will also be a couple of figures based on the book's human protagonists." "They're two inches tall, they're really poseable, they cost less than $10 for a 2-pack... it just made a lot of sense for the brand." Stealth Black Vorin Minimates Figure Coming? UPDATE: Diamond's own Zach Oat confirms it: "And there will also be a retailer incentive Minimate of Vorin in "stealth armor," available to comic shops that buy 25 copies of the comic." "This [retailer incentive] figure will be a 'Stealth Black Vorin' according to my Diamond rep. It will only be available through this promotion. We will not be carrying them, as we don't sell comics. If the number [of comics to order to get one figure] was lower than 25 I would consider it. " As the comic book will be around $4, it wouldn't be out of line to expect the figure to sell for mid-double digits. I'll be watching eBay, as the possibility of having a hole in my collection right out the gate is troubling. Of course, the wholesale value of 25 comics is probably in the $50-$65 range, so hey, maybe you might buy a bunch to have something to hand out to the older trick-or-treaters? 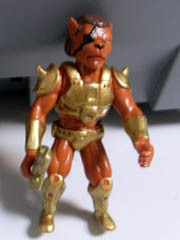 Your pal and mine Nik pointed me out to this thread on TFW2005, which features some interesting recolors of Masters of the Universe Classics figures as Pirate Leo, Skull Grotess (pictured), and Transformers Pretenders Catilla! It's totally unrealistic to expect Mattel to make such a thing, but I'd certainly buy the Hell out of it. 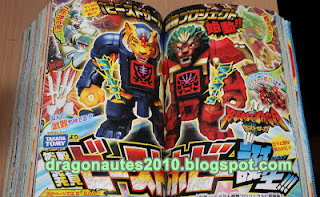 Let's all bug ToyGuru! Once again, Battle Beasts superfan Sylvain added 3 new pictures of Beast Saga stuff to his blog, which confirms what many of us expected-- there's a trading card game, too! 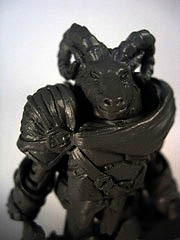 You can also get a look at the dice-launcher mechanism in the figures, plus a painted sculpt of the previously-unseen-painted tiger (unpainted samples were at Sylvain's earlier.) Cool! Check it out. 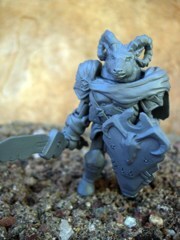 "Note: These are the first pics of the sample sculpt. Not final at all. Also, this is the original factory that we already paid for this order. Not the current factory that we are working out specifics with." Go see more, here. Registration is required for the pictures. When Diamond Select announced their plan to revive the Battle Beasts brand, that was my indicator to jump on the vintage guys-- people were ignoring them, and they may still be ignoring them, but I wanted to get as many as I could before that changes. (For the record, I completed a US set as of March.) Anarchy was one of the few Laser Beasts I picked up as he wasn't too pricey, and was pretty cool as another mole in this series. With a drill arm and a drill weapon, thematically, he's pretty awesome as a construction/destruction/explorer type. It's Vorin! 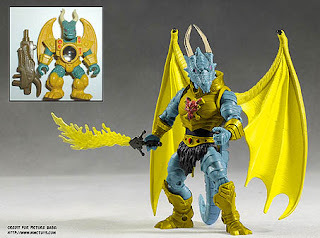 The first named new figure in Diamond's Battle Beasts line is here, and the C2E2 exclusive gets a bunch of photos over at 16bit.com. Want to read more? Click here!